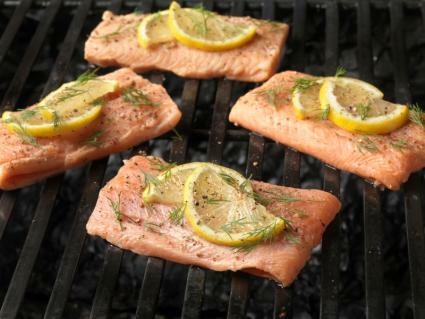 Wild caught salmon is a Perricone staple. Dr. Perricone is already renowned for his popular skin care line and his original anti-inflammatory diet which claims to fight aging and minimize wrinkles from the inside out. However, he has recently launched a three day diet plan which also claims to provide a dramatic difference in your skin tone over just a short period of time. This diet requires extreme dedication, but it is not without flavor or merit in its approach. You can review the details of Dr. Perricone's 3 Day Diet at his blog. He compares this brief dietary endeavor to "a facelift in your kitchen." Though such promises may seem extreme, the science behind Dr. Perricone's diet is mostly well documented. Perricone proposes a diet that is high in antioxidants and essential fatty acids. For over a decade the United States Department of Agriculture has been promoting antioxidant rich foods as being useful for cellular renewal, thus promoting longevity and health. The USDA concluded that the foods highest in antioxidants were capable of warding off harmful free radicals that are responsible for aging and many kinds of disease. Moreover, the Mayo Clinic touts the importance of certain essential fatty acids within the diet, particularly the omega-3 fatty acids found in fish and fish oil products. These good fats may lower triglycerides, relieve inflammation within the body, and decrease your chance of cardiovascular disease and stroke. Dr. Perricone's love of wild caught salmon is a nod to the importance of these fatty acids. DMAE is an anti-inflammatory substance which promotes the production of a neurotransmitter called acetylcholine. Acetylcholine is primarily responsible for the communication between nerves and muscles. High amounts of acetylcholine may help to tighten the muscles and, thus, combat excessive aging. Astaxanthin is an antioxidant found in marine life such as plants, algae and seafood. It fights free radical formation and oxidative stress. By this mechanism astaxanthin may be useful for fighting premature aging as well as maintaining health. The role of essential fatty acids has already been outlined in this article, but the importance of these acids, when it comes to preserving a youthful appearance, cannot be emphasized enough. Fat often has a bad reputation; however, healthful monounsaturated fats are not the same as trans fats or saturated fats. The American Heart Association is well aware of the dietary advantages offered by omega-3 fats and other plant-based monounsaturated oils. The elements of this diet are fairly well-rounded and comprised of lean sources of protein and fresh produce. Plain yogurt is an excellent source of probiotics, and oatmeal can provide the dieter with a gluten-free source of insoluble and soluble fiber. Dr. Perricone believes that the aforementioned foods may be direct causes of inflammation in the body as well as oxidative stress. This diet is relatively basic and easy to work with. For more suggestions, view Dr. Perricone's 3 Day Diet shopping list. Dr. Perricone's 3 Day Diet is actually just a preview of his overall recommended diet plan. His feature book, The Perricone Weight Loss Diet, applies the same anti-inflammatory principles as does his 3 day plan. The focus on antioxidant rich foods remains the same. Though Perricone's recommendations may seem too restrictive for some individuals, the diet is well balanced and clean. Acne sufferers who are sensitive to iodine may not thrive on the Perricone diet. ScienceDaily.com is one of several sources that documents the potential connection between dietary iodine and acne flare-ups. Also, persons with certain food sensitivities may not respond well to some of Dr. Perricone's suggestions. Always talk to your health care provider before attempting any dietary chances and keep alert for any allergic reactions that may arise after the eating of unfamiliar foods.